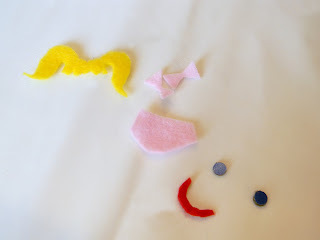 Today we've got another talented Hot Glue Gun Crafter with a fab tutorial. Say hello to Kimberly from Bugaboo, Mini, Mr. & Me! Hi there, Sew Can Do-ers! 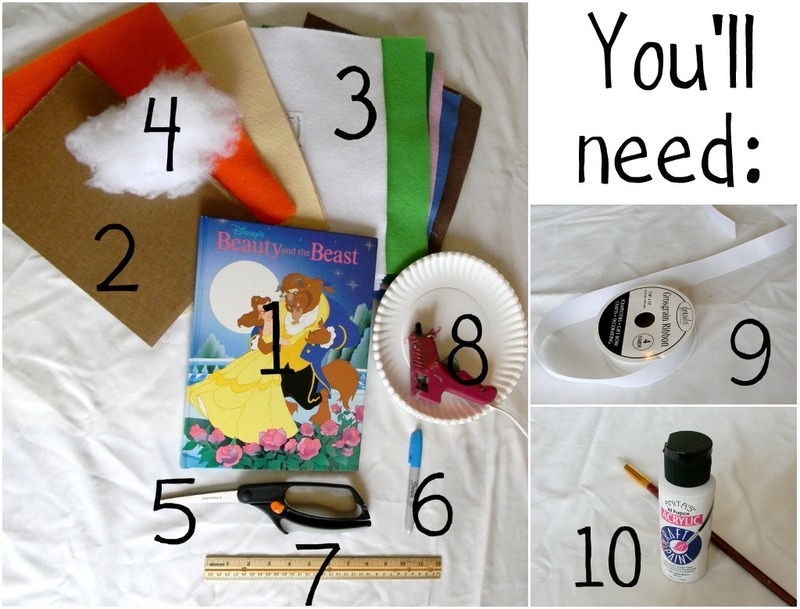 I'm beyond excited to be here sharing a glue gun project with you! I'm Kimberly, the "me" in bugaboo, mini, mr & me. I'm in love with the creative process and blog about my forays into crafting, cooking, DIYing and corralling the natives (AKA, trying to keep up with the little kiddos around here). I love mod podge. I love paint. I love fabric and ribbons and WREATHS (weird, I know) and sewing machines and sergers... and I really love my glue gun. I wanted to show you something kind of original to do with your glue gun, and as I brainstormed I thought of something I've been meaning to make for my daughter - who's 20 months. 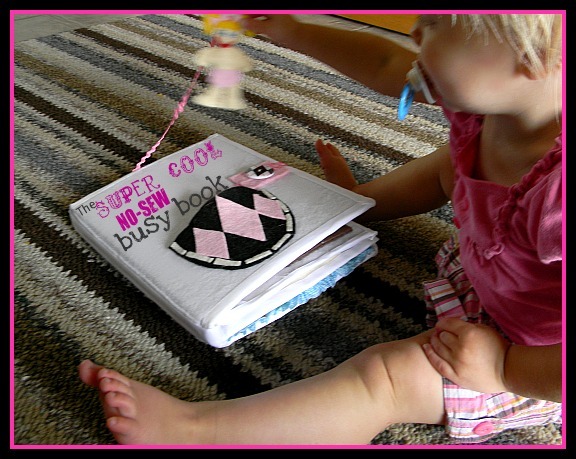 You've seen oodles of handmade quiet books all over craft blogland, I'm sure, and I've always wanted to make one for my kids - like my mom made for me. But I'm intimidated by all of the applique and interfacing and sewing together. And what about all those people out there who are crafty but not so much sew-y? There have to be some of you out there, right? Well, here you go! A completely no-sew, all GLUE GUN quiet book variation for you and your little bug. Just a separate note, since my daughter is still a little young, I decided to use velcro for most of the pieces instead of all kinds of zipper and ties and buttons. It will still keep her busy and she won't get frustrated (does anyone else have a 20 month old who refuses help with EVERYTHING??) BUT you could definitely add more fasteners like snaps and hooks and such if you'd like to. * about the cardboard - before you do anything, you'll want to figure out how many pages you need. 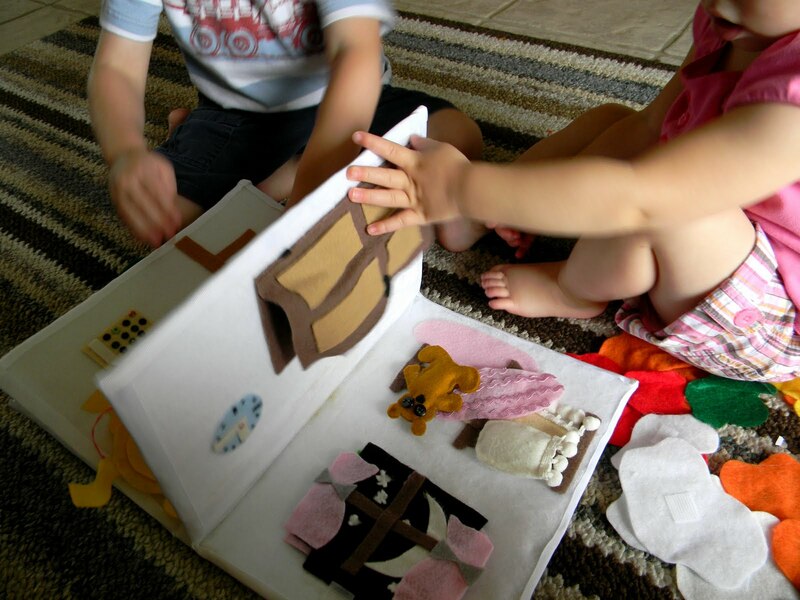 You will only be using the hard front and back covers from the picture book and you will need cardboard pieces for each other page you want in your quiet book. 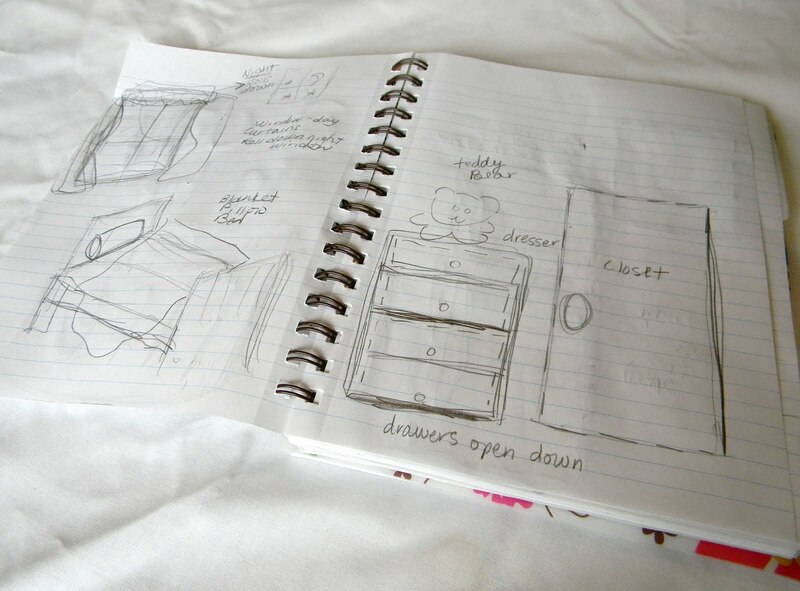 First off, you'll want to sketch out how you'd like the pages to look. That way, you can get an idea of scale and size, not to mention how to place everything so it's all accessible. Do NOT make fun of my sketches. At least not to my face. That down there is supposed to be a bedroom. Measure your cover. 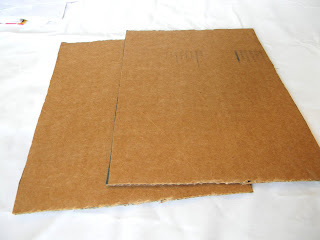 Cut your cardboard pages to the same length and about 1 inch narrower. Now, decide what color you'd like the background of all of your pages. If you choose a dark color, the next step will be a bit different. Darker colors will probably cover up the pictures and words without problem, but if you use a light color like I did, you'll want to paint the covers first. Paint the entire front cover. 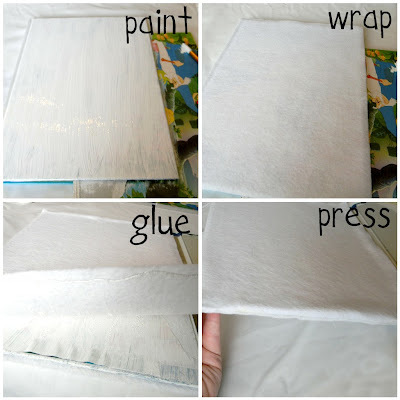 Lay your piece of white felt over the paint - don't wait for it to dry because as it dries it will act kind of like a glue and help hold the felt on. Then, spread hot glue along the edges of the felt and press them over the edges of the book. I was pretty lucky that the book I chose was almost exactly the same size as a single sheet of felt, so I didn't need to do any measuring and cutting. But if your book is smaller or larger, you may need to make some adjustments. Once you are done painting and putting felt on the outside covers, you'll want to glue felt over the inside as well. 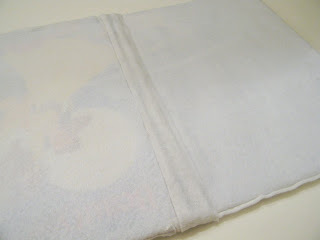 Then, cut two skinny strips of white felt and use your hot glue to adhere them to the binding on both sides. see how you can see the front cover through the felt? When the paint dried, you couldn't really see it anymore, although two coats probably would have been even better. Now, you'll want to cover all of your hot glued seams. Open your covers up and lay them face up. Measure all around the perimeter and cut ribbon to that length. Then, hot glue the ribbon all around the perimeter of the covers so that half of the ribbon is glued on to the front and half of the ribbon is hanging off the edges. When you get to a corner, fold your ribbon at an angle and hot glue it down. Then, simply continue all around the covers. Now, take your two pieces of cardboard and cover them with felt, front and back. I used the same process as I did with the covers - paint, wrap the felt, glue the edges, and press them together. So, total I used 8 sheets of felt for the pages. Next, you'll cut a strip of felt the same color as the pages. Make it the same length as the pages and about 4 inches wide. Now, you will glue the two pages to this strip leaving about two inches of the felt in between. See where that arrow is? That's the gap in the middle. The strip is glued to the pages on the back. 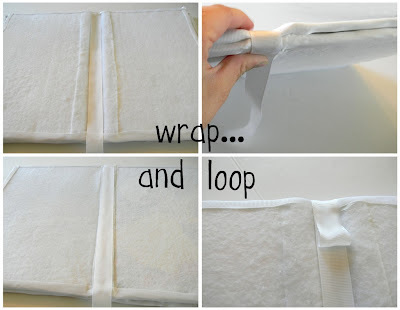 Then, take your pages and wrap ribbon all around the perimeter, just as you did with the covers. 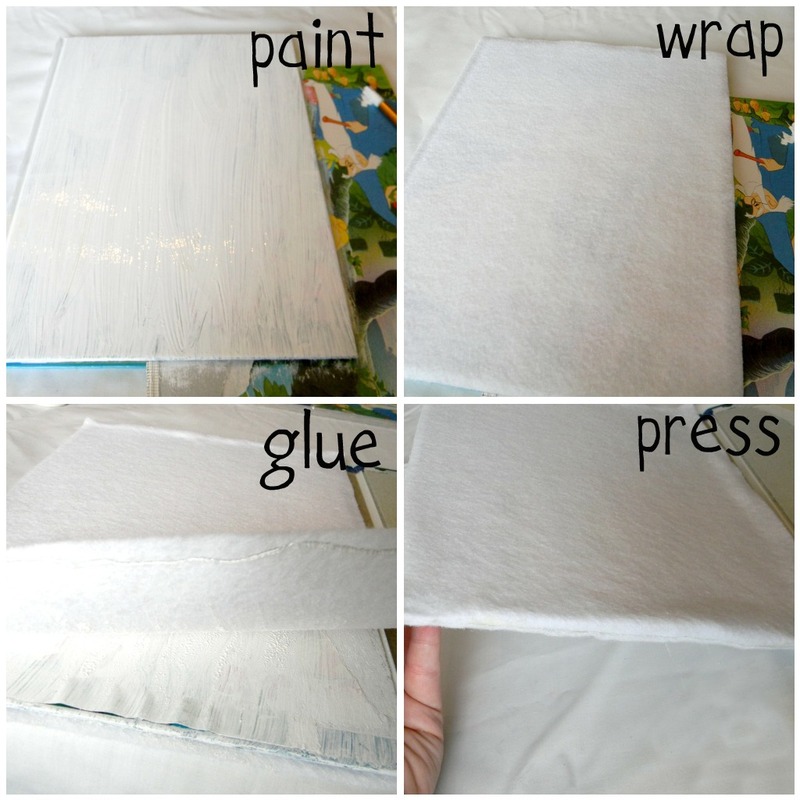 Once you are done, spread glue all over the back of the strip of felt between the two pages and press this down into the binding of your covers. (That's the second picture). Now you'll make your spine. Measure all around the binding and cut a piece of ribbon that size plus a couple of inches. 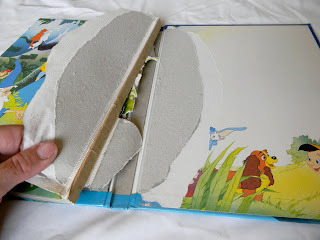 Then use hot glue to adhere it all along the inside and outside spine of the book. Start at the inside top, glue it all down the inside, wrap it around the outer edge, hot glue it up the outside back of the spine, then around the top edge of the book ending where you began. At the inside top of the spine, tuck your ribbon under and glue just the end, so there is a little loop of ribbon. 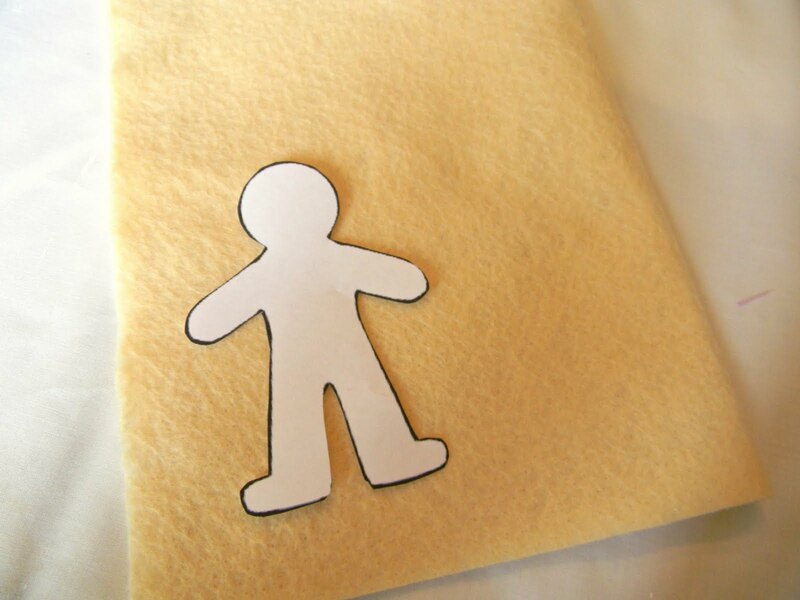 Now you need to make the doll that goes inside the book. This doll should be a miniature version of your child, so make the eye and hair color reflect that. I simply googled "person outline" and printed it out at the right size for my book. I used this as a template to draw around on my felt. Make sure to cut out two pieces - a front and back. Next cut out all the pieces for the dolls face, hair and little knickers. Plus any other accessories you think she needs. Remember that everything besides the face will need a front and back. (Unless your child has eyes in the back of her head. Which is generally only a symptom of motherhood). 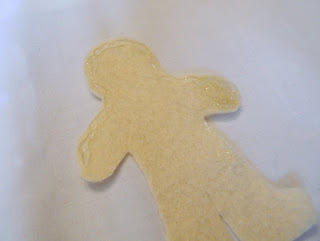 Glue the front pieces on to a piece of person-shaped felt. 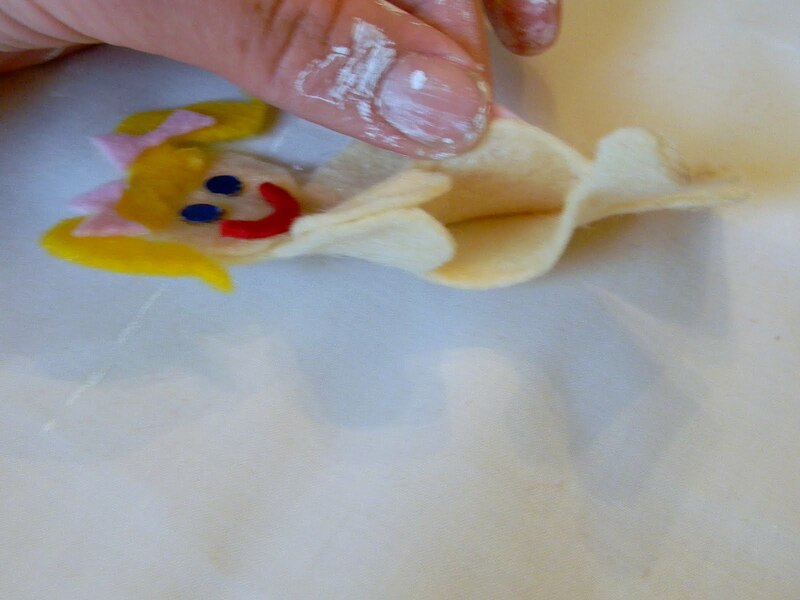 Also, glue the back of the knickers on the other piece of person-shaped felt. BUT don't glue the back of the hair on yet. Now, draw a line of hot glue all around the inside of the front piece, leaving about two inches UNGLUED. And push the front piece against the back piece, insides together. Like so. Notice the gap where there was no glue. Now you can use some of your batting to stuff her. 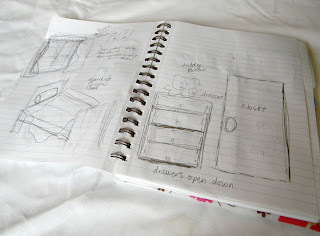 Mine was pretty darn small, so getting into all those little nooks was no easy feat. I guess patience is the best tip I can give you here. Once she's all stuffed, just draw a line of glue along the gap and stick her together. Measure out about 18 inches of ribbon or ric-rac and glue it to the back of her head. Glue the back piece of hair over the top of the ric-rac. 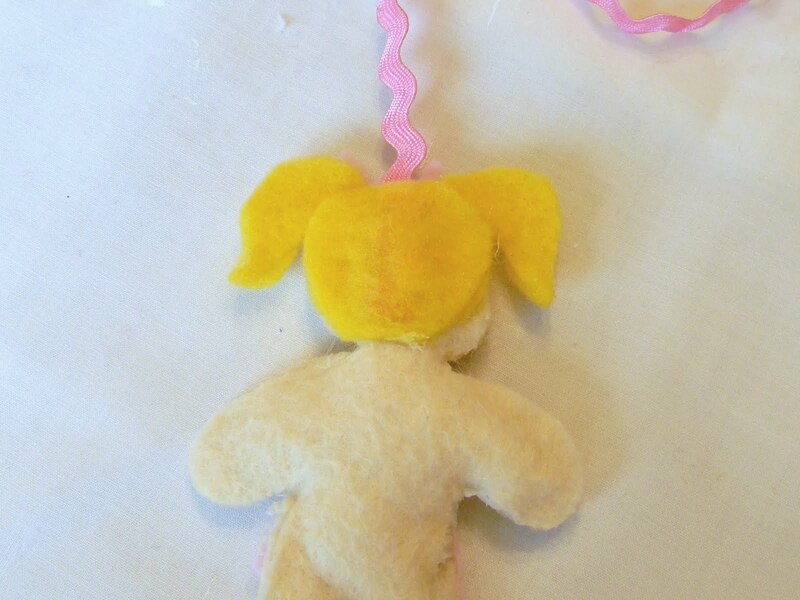 And you've got a ribbon doll! Wait. What? Well, now you'll take that ric-rac and tie it in a knot into the loop of ribbon on the inside of the spine. That doll isn't going anywhere! 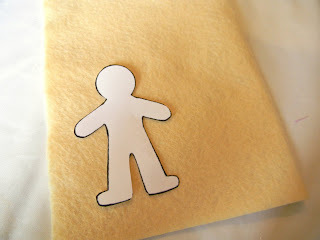 Come back tomorrow to see Part 2 of the Hot Glue Quiet Book: Page Details (click HERE). Great project start Kimberly - can't wait to share tomorrow's page decorations! Ce livre est vraiment une trouvaille! I love this! Could you tell me the size of the book youused? This was a lovely guest poster's project. You can email her at bugaboominimrandme@yahoo.com to find out the size she used.